Rainbow unicorns! How did they know I wanted one so badly!! I hope everyone had a lovely holiday. Ours was quiet and nice. The house is in boxes. We're moving, and I should be packing now, but I thought I'd try to get a post in today while I have some time. 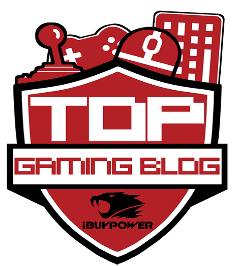 I had a nasty cold for a week and over the holiday I still felt so drained from recovering, I ended up doing some gaming that was just fun and jump in type stuff. Not much thinking, just doing. It started last week when my son told me there was a rainbow unicorn for free to claim in Trove. 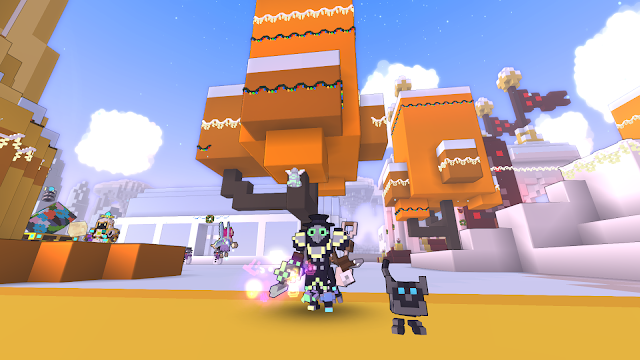 I haven't played it much lately, but I ended up mostly playing Trove through the whole holiday weekend and into this week. What's nice is it is easy to jump in and out, easy, always something to do, it is simple and fun. I managed to get my Chloromancer to level 28, she started at 18 when I logged back in. My son knows most of the in and outs with gearing and progression in the game and really helped me move along. I was happily bumbling around in the lower uber levels, not really worrying about gear gems or anything. 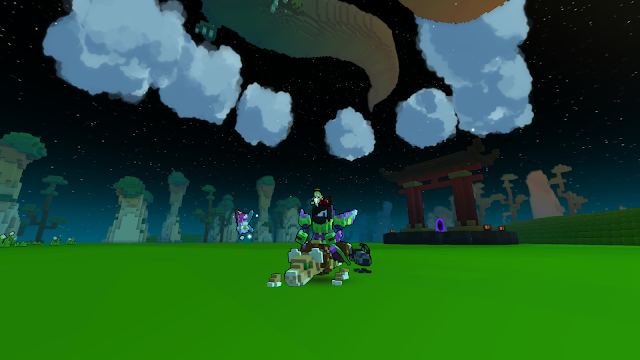 Which is the nice thing about Trove, you don't have to race to the top, you go at your own pace. I managed to gear up, level up and enter those higher uber levels, which I can easily hang out in now. 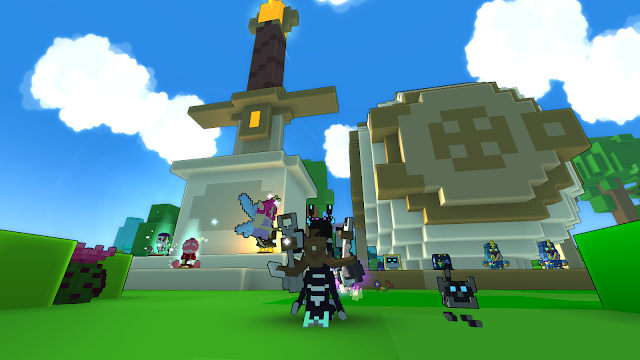 It was fun to see my character zoom up in levels and power. We upgraded the club also, with only us two playing it is slow going and he would probably do better to main another more active guild. I always have worked on my club keeping all the portals and crafting stations up to date. 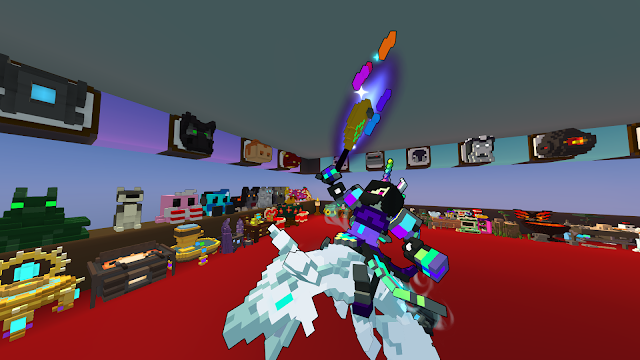 So he added a few things, club quest station, and another upgrade station. Slow going but I love this little club. It is the only guild in any game that I really have kept up and decorated, I just love it. He wants to welcome other players in, I am considering it, not quite sure yet. I don't mind but I also want to make sure I keep it active and managed, maybe after the move I'll have more time. A shot of the old Hub. You can get there from the new Hub if you fly west until you hit it. You'll take some damage but with potions you should be able to check it out. I ported over to my son after he flew, lol. I have really had a blast. The chlormancer gets some really cool costumes at 20, so she looks pretty snazzy for a voxel/cube character. 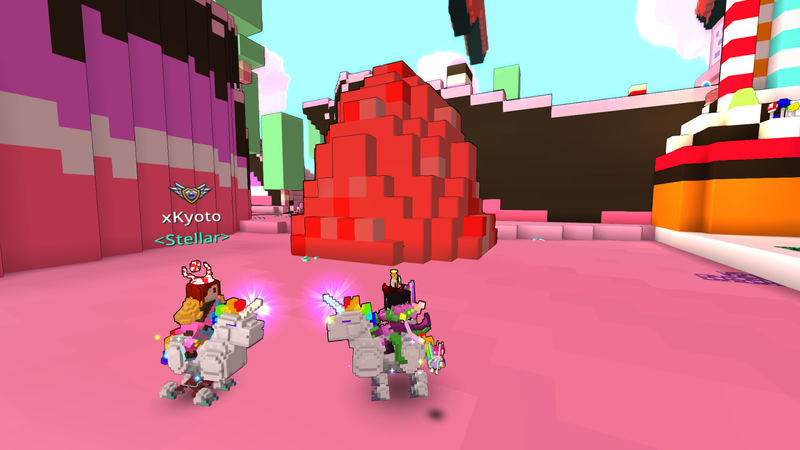 I've collected some cool mounts, made some moneies and just had a lot of time to get reacquainted with the game. I find myself logging in every day. There are always neat things dropping as loot. Boxes to open, chaos chests, presents for the holiday. Trove can be a grind, I've seen people complain about that, but it is also what you make of it. How fast you want to progress or if you just want something to do to kill some time and relax and progress at a slower rate, you're not going to be penalized. 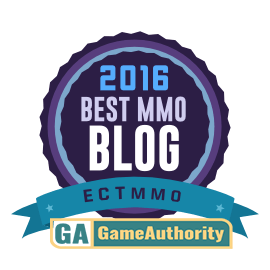 I loved things like this about GW2, go as you choose, level, explore, have fun. But the rewards felt so measly, and most of the things I want are in the cash shop, not available in the game, like mount skins. I guess sometimes a break is nice. Rift has slowed down a lot and had some crazy cash shop prices that annoyed me. EQ2 is still fun, but I needed a break from tabbing to the wiki for the expansion quests for a few days. WoW is still a slog through the unlocking flying content sometimes, and the next expansion we'll have to do it over. Trove gets me away from that stuff lately. For now it is all I felt like playing and it is nice being back and playing regularly. 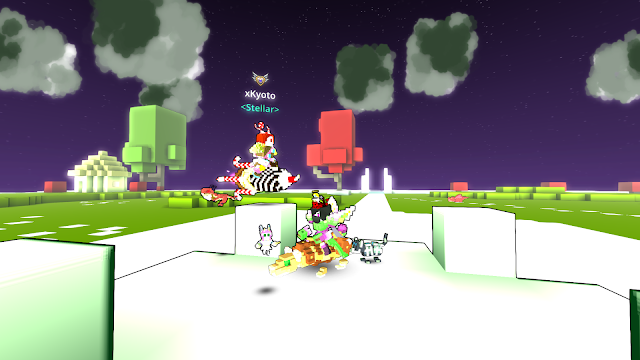 The game has gotten a lot of updates over time and keeps getting more, the community is bustling and it feels alive. 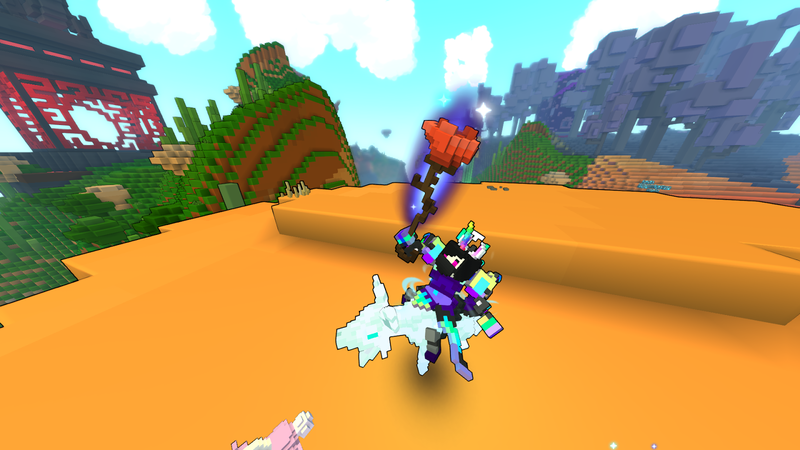 Where Trion may have slipped with Rift, they surely have not with Trove, it keeps getting better and better. What I once thought were kiddy graphics, now appeal to the kid in me. New additions to the Club. One of the newest biomes, very pretty with an Eastern feel. Another shot of the old hub, Sam looks lonely. Adventure time! 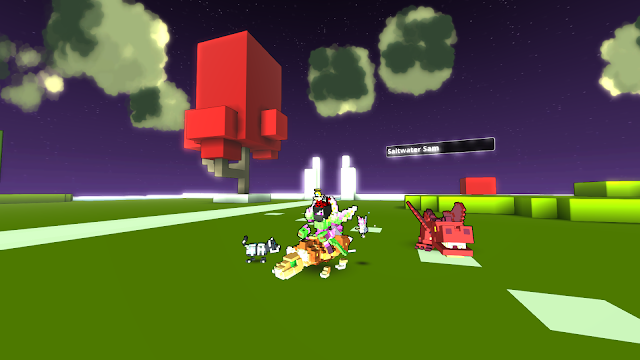 I sort of feel like I am in an Adventure time (cartoon) setting, here in Trove. My plague doctor themed costume, so cool!